Friday morning, at 8:30 AM ET, the Bureau of Labor Statistics releases its June Non-Farm Payrolls report. If you’re currently shopping for a mortgage, or floating a mortgage rate, be prepared. Mortgage rates can change following the monthly report’s release. More commonly called “the jobs report“, Non-Farm Payrolls reports on the U.S. workforce by sector, summarizing its findings in terms of total workforce size, and as a national Unemployment Rate. Jobs are considered a keystone in the continuing U.S. economic recovery. For June, analysts expect the government to report 80,000 net new jobs created, and no change in the 9.1% Unemployment Rate. Although these figures are slightly below than what can be considered “strong growth”, that’s not what should concern Franklin rate shoppers. Mortgage markets react to a deviation from estimates more than to the actual results themselves. This is because Wall Street placed bets in advance of the jobs report’s release. 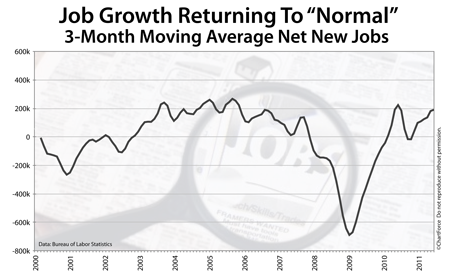 If jobs growth tallies more than 80,000, therefore, it signals better news for the economy than what was expected. This will push banks and investors towards equities, and away from bonds — including the mortgage-backed kind. With less demand for mortgage bonds, mortgage rates will rise. Conversely, if jobs growth is less than 80,000, mortgage rates should fall. Mortgage rates remain near their lows for the year, but if the June Non-Farm Payrolls report beats estimates of 80,000 jobs made in June, look for mortgage rates to spike. The safe move is to lock today.